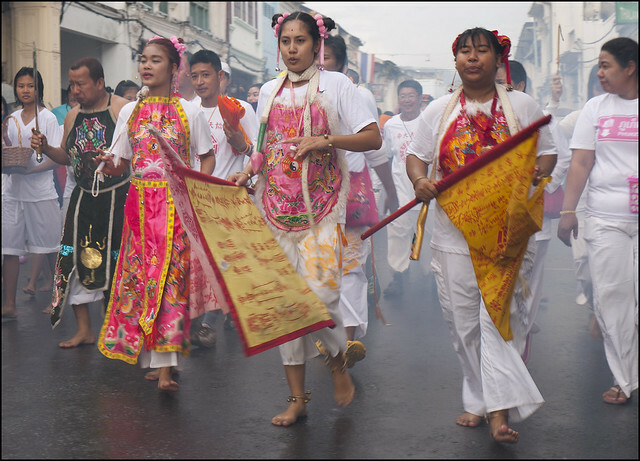 The 2018 Phuket Vegetarian Festival (aka Nine Emperor Gods Festival) was held from 8 - 18 October 2018. The dates change every year, as it's based on the Chinese lunar calendar. Next year it'll start on September 28th 2019. It's my favourite Phuket event / festival and I always take too many photos! I sold my "nice" camera a while back, and for the last few years have been using a combination of an old (but OK) Lumix mixed with iPhone photos! Last year I more or less totally ignored the festival because all the main events and processions were cancelled due to King Bhumibol's funeral taking place the same week. In 2018 I expect things to perhaps be even wilder to make up for the sadness of 2017. There is a lot to this festival, it took me a few years to understand, and there are still parts of the festival I have not seen much - I have only attended one firewalking event and it was so crowded that I didn't get great photos. And until 2014 I had not experienced the crazy final night procession in Phuket Town - I have now been a few times and it's absolutely crazy! Most of the events happen far away from the main tourist beach areas, mostly in and around Phuket Town or at the various Chinese shrines around the island. If you are in Phuket during the festival, I do recommend that you try to see something! 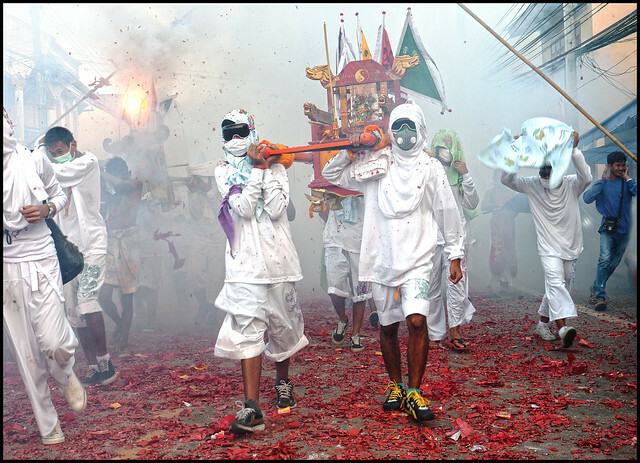 • Phuket Vegetarian Festival - My Favourite Festival in Phuket. The start of the 2018 festival will be Monday 8th October in the late afternoon when the "lantern poles" are raised at all the participating shrines. The Emperor Gods are said to descend down the poles into the shrines at midnight. I often attend Kathu shrine (my local) as I did in 2011 : Photos of Pole Raising and Midnight Ceremony. Not too much happens for the next couple of days, but the Chinese shrines are always interesting to visit any evening or any time during the festival really. The first big street procession will be on the 11th October ... or actually the 10th - a few years ago the small "Naka" shrine joined as a newcomer in the festival and will be the first to have a procession. 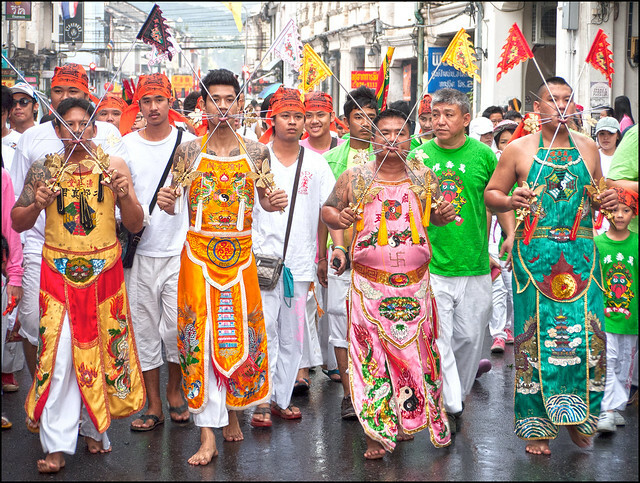 All the main street processions pass through the old Phuket town area, all of them start early (around 7am or earlier), all finish either at Sapan Hin (south end of town) or back at their home shrines if the shrine is in or near Phuket Town. At all the Chinese shrines, sometime between 4 - 6pm - raising of the Go Teng pole. Events at the shrines will go on all evening. The lanterns are hung from the pole at midnight, signifying the start of the festival. There will be plenty of firecrackers and fireworks too. In 2011, I went back to the shrine just before midnight expecting some bizarre ceremonies, but it was far more hushed and reverential and kind of spooky. Did not leave the shrine until 1am and people were still gathered there saying prayers. 9th - 10th October - there are no big events on the first 2 days of the festival except for a small procession from Naka shrine on the 10th, but people can visit any shrine at any time, and the Jae (เจ) food is to be found all over the island but mostly around the shrines and especially in Phuket Town. The festival has many aspects and the food is one part of it. I normally try to stick to the strict diet during the festival. No meat, no alcohol. Not just "no meat" - it's vegan, so no dairy either and the food is specially prepared with clean utensils and certain other ingredients like garlic and onions are not allowed due to the strong flavour. Don't worry if you are not vegetarian, almost all restaurants are open as normal in tourist areas. In fact, it can be hard to find the special festival food near the beaches. Street procession into Phuket Town from Naka Shrine, located next to the weekend market just outside Phuket Town. This shrine is a newcomer to the festival and has only been doing processions for a few years. I visited in 2014 and it was quite crowded with "pro" photographers looking to get the first photos of the festival. Some photos here. Street procession starting 7am for Sapam Shrine - this shrine is a few km north of Phuket Town (about a 10km walk from the shrine to Sapan Hin). To see piercing taking place at any shrine you have to be there before 7am. Try 6am. In the evening, around 7pm (better get there earlier), there will be another procession around Kathu village for the Birth and Death Gods (Lam Tao and Pak Tao). I was there last few years for this very noisy procession! A similar procession also takes place at several other shrines on the same evening. I believe there is a very big one at Jui Tui Shrine. Today's big street procession is from Sam Kong Shrine. Procession goes from the shrine in the north of town (not far from Tesco Lotus), past the Bangkok-Phuket Hospital and through the old section of Phuket town. The shrine is not far from my house and I find that they have some pretty gory face piercing! The Sam Kong area is also a good area for food hunting during the festival though parking is a b*tch, there are stalls all along the street here for half a kilometer. It's a good one to attend early in the morning. The street procession today is from Tha Ruea shrine which is in the Thalang area of Phuket in the center of the island - this used to be the main town in Phuket a couple of hundred years ago and there are several historic temples in the area and the annual Heroines Festival celebrating an important date in the history of Phuket - the Heroines story predates the Vegetarian Festival by several decades. Lots of things going on today... In the morning (7am), a huge street procession in Phuket Town for the Bang Neow Shrine, which is in the south of the town on Phuket Road, one of the biggest and most important shrines participating in the festival. Expect very big crowds in town on this day. I have been in town many times for the Bang Neow procession, but have not tried to get into the temple due to the number of people. There is also a smaller procession starting 7am from Cherng Talay Shrine which takes place in Thalang district in the Cherng Talay area. A good one to see if your hotel is in Kamala, Surin or Bang Tao beaches and you don't want to head all the way to town. 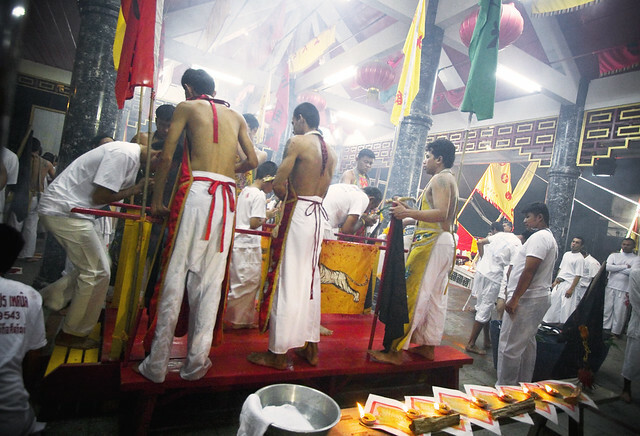 Also on this date ... Fire Walking at several locations including Sapam Shrine, Sapan Hin (participants from Jui Tui shrine), Baan Tha Reua Shrine and Sui Boon Tong shrine (just west of the market and not far from Jui Tui shrine in Phuket Town). Fire walking kicks off around 8pm. Maybe I'll try to get some firewalking photos again this year. Street procession starting at Jui Tui shrine, which is probably the biggest shrine in Phuket town - just west of the main market. I went to see the procession in 2013 and 2014 - it was very crowded but I got lots of photos! It is hard to get into the shrine early morning, better to find a spot just outside or along the procession route - the route is always easy to find - just follow the people and the little shrines that people set up outside their houses - that means the procession is coming this way! The area around Jui Tui and along the street from the market is always busy and lined with food stalls during the entire festival. Later in the day, there are lots of events on the schedule at various shrines including bladed ladder climbing at Sam Kong and Bang Neow shrines and "nail bridge crossing" at Sapam Shrine. Not sure what that is! We did go to watch bladed ladder climbing one time at Sam Kong, I did not take a camera as it was a bit rainy outside, the weather can be a concern at this time of year, but usually not too bad and sometimes darn hot! The bladed ladder climbing did not seem too dramatic. Can't say I saw any bleeding feet! Street procession from Kathu shrine to Phuket Town. It's a long walk this one, about 10km from Kathu Shrine all the way to town, around the old town and ending at Sapan Hin. Kathu is my "local" shrine. The shrine is only about a mile from my house. I have been there early (6 - 6:30am) the last 4 years to watch piercing rituals. Should try to get there even earlier. 6:30am is a bit too late really! Must make an extra effort! I think 5:30am would be better. But hard work! Things happen early in the morning that are mysterious. The piercing may freak people out the first time they see it. I am now just looking for better camera angles and want to get some video too. 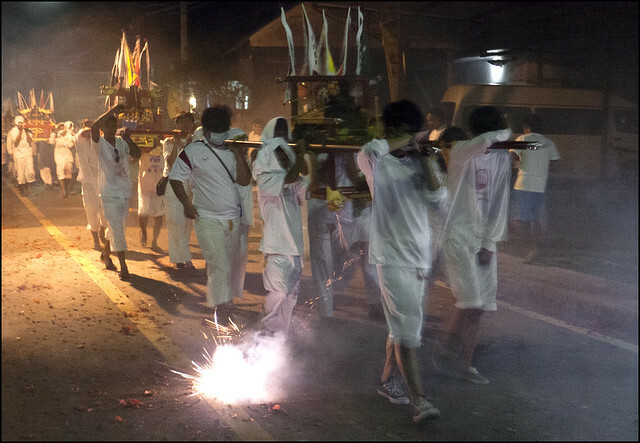 Later in the evening on October 16th - fire walking at Bang Neow, Cherng Talay and Sam Kong shrines. Got to be worth a look! The last full day of the vegetarian festival. 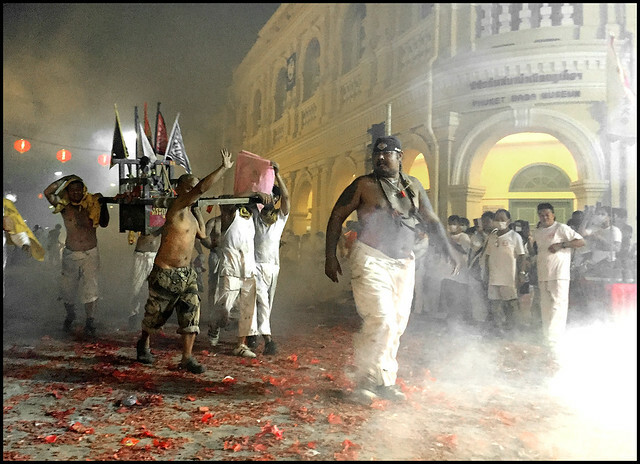 There is a street procession for Sui Boon Tong shrine in town early in the morning which I attended for the first time in 2016, then events such as firewalking at Kathu shrine in the afternoon - I went in 2010 and I did take some photos, but the firewalking seems to draw very big crowds. Maybe I'll try again this year at one of the shrines. Maybe come with a stepladder to shoot photos over everyone's heads! Or a GoPro camera on a selfie stick might work! In the evening/night of the last day (17th October) there is be a huge procession around Phuket Town, with people carrying statues of the gods to Sapan Hin. Millions of firecrackers and fireworks. It is absolutely mad. I went for the first time in 2014. Again in 2015 and 2016. There is so much smoke and so many firecrackers, it's advisable to wear long trousers, a shirt with long sleeves and something more than flip flops or you'll get burnt feet! Need to wear a cloth or face mask over your face too, to avoid too much smoke inhalation! And earplugs would be a good idea. It's like a warzone. A friend had a firecracker land in his pocket a few years ago and melt his iPod! 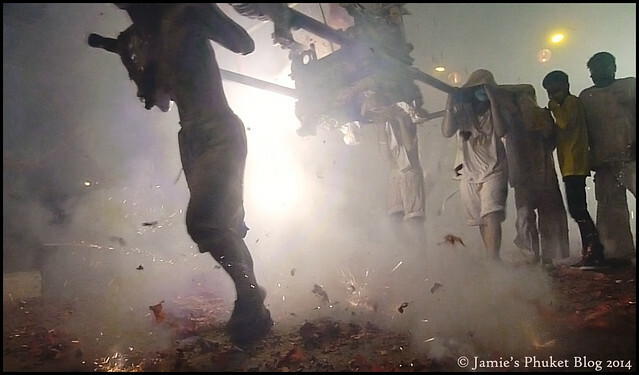 Read more @ Final Night of the Phuket Vegetarian Festival. Earlier in the evening on the last night there is the "Bridge Crossing for Purification" ceremony at the shrines. We did this in 2011 and it was an evening I enjoyed very much. Everyone in white, lots of smiles, no bloody faces, seemed like the whole village was there! At about 5pm the lantern poles (Go Teng poles) will be lowered at the shrines marking the very end of the 2018 Phuket vegetarian festival. The 2019 date for your calendar : 28 September to 8 October.